The price objective given was a direct challenge of the March 2007 price lows which was fully satisfied in August. The price pattern objective was for a trading range, or high level consolidation pattern, to develop. To this point in time, no new lower price objectives have been given, nor for the call of a consolidation pattern has been nullified. Using a touch of cycle work known during this same July price and time projection, it was also suggested that much of the work of that it was going to be needed to repair the damage created by this same Summation Failure pattern was going to take several months to do so, and with the next nesting of the 9 month cycle due in the middle part of December, this seemed to be a reasonable time target for completion of this same pause in the larger uptrend. Over the last week or so in the chat room, we've have been re-evaluating the most consistent Elliott Wave pattern scenario that would also compliment the information provided above - a Flat or Triangle - and I took a moment to update the ongoing chart you see below as to our current placement within this total analytical context. Although both the Flat and Triangle ideas remain in play here, it is a bit unusual to see higher breadth extreme readings in wave C than in wave A if the pattern was tracing out an Elliott Flat. 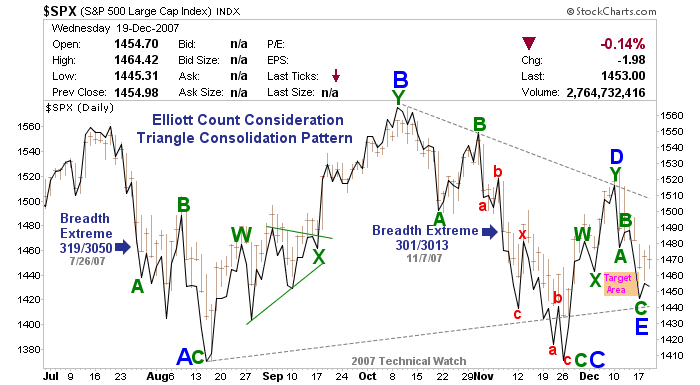 However, this kind of Elliott relationship in breadth extremes can and do take place when Triangles are forming (gray dashed line), so at this point, the blueprint here would be for a lower price low to finish off wave C at a higher level than that of the August lows, and then waves D and E to follow which would complete the price pattern structure sometime in the middle part of December. In any event, the one month window of the next 9 month bottom opens next week from where either pattern continues to be the higher probability consideration - but the odds of another month of sideways action in the form of a larger triangle (over a simple Elliott flat) is now at about 70% chance of being the preferred outcome when all is said and done. Updates of this count will be reviewed either by post, or in the chat room, as warranted or requested. 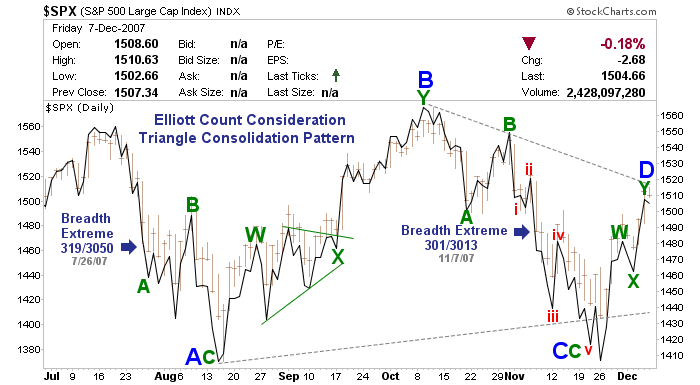 Updated chart through Friday's close...the triangle count is marked in gray. MCO flags and divergent structures are set...less than a month to go. Where exactly would waves D and E fall in this chart--within the triangle presented--I'd guess, but wish to confirm. Any rules govern what general range or retracement we might expect D and E to land price wise? Thanks. Where exactly would waves D and E fall in this chart--within the triangle presented--I'd guess, but wish to confirm. Any rules govern what general range or retracement we might expect D and E to land price wise? 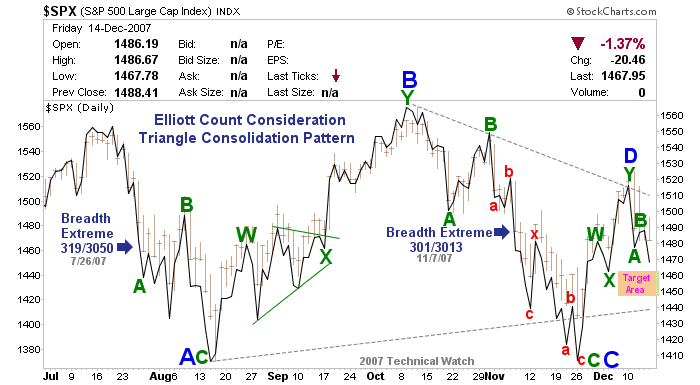 Elliott triangle guidelines would suggest a move that would be .618 times the length of the prior price range. The guidelines in an Elliott flat are pretty much in the area of equality between the 3 structures. So, in this area, the SPX could see another 10 to 15 points lower from the 1416.77 levels seen last Wednesday which would project the low for wave C at around the 1400 to 1405 area. However, much of this same projection is dependent on the height of the current retracement that presumably began on Friday. From that stopping point, we can later on figure up a sharper termination price target. All in a perfect Elliott world, of course. Thanks Fib. Exactly what I was looking for. But after today's action, it is a moot point, isn't it? The flat option wins, right? The flat option wins, right? Adjusted count shown below...now in an irregular flat 4th wave with an objective of around the 1445 level. thinking of the 4th wave "guidleline" obj of area of 4th wave of 1 lesser degree, which is 1480 area? even tho I'm lilely to be confused, the dithering around where you have the last little a & b seems, again, to be awf'ly puny for a 4th wave of the over all move from 1560 -1410. This would be a minimal target expectation for the pattern with a higher 2.618 objective as the next stopping point. So if we take this calculation into consideration, the next price target becomes 1469.87 which is certainly within the range of the 4th wave of one lesser degree, and with the current SPX level at 1463, seems to be a reasonable target area to look for. Seems to me you have a firm grasp of the situation...thanks for the question. Most of what little I know is from reading experienced people like you who are so generous in sharing. Decided to update my eMail address on last visit. What with Spam filters, etc, such well meaning decisions become major projects. Second, I'm sitting here drooling at the prospect of shorting the 5th wave, can't hardly wait to hit the sell button. There's been mention of "the" 5 week cycle, and giving credence to that thought, then allowing some up movement now then the next low of thet cycle would be hard down along with the 9 month etc, that low could be later than the mid Dec 9mo target, so what could be looked for that would be the "trigger" to short in here, what with thse lows looming this 5th wave could be very rewarding. And of course, if short where does one stop out if wrong? All in a perfect world. So far, we've come within 16 points intraday for the projected D wave high. Interestingly, the Hurst 5wk cycle projection is to about 1508, which is smack dab in the middle of the two D wave projections using closing and intraday data. Looks like this thread is now on two tracks, which could be OK as it turns out. I had thought the triangle idea was about the waves from this last move down from 1565, which still appears to be a really nice 5 wave formation. if the triangle mentioned some post ago really does relates to the top in July and the moves since, does that negate using the the move down from 1565 for trading points? If as it appears to me the current pop is a 4th wave of the 1565 down set of waves, the "area of the prev 4th wave of 1 lesser degree is here in the 1480 ish range, so, the 1508 target seems a stretch, but does a move to 1508 negate the 4th wave supposition? (and, that 5 week cycle would have only 1 or 2 weeks up leaving 3 down, which could make the 1445 "E" target shakey? If wave E's target is 1445 ish, then that calls for a 5th wave failure of the 5 wave down structure of the "C' wave down of what may be a really big triangle; which, if it is a failure, together with the resulting huge double bottom would be insanely bullish, yes?? Not complaining, just would like to even just stumble onto the right path., being really late friday nite. Mike, not trying to confuse things, sorry. My knowledge of e wave is minimal. I was just extrapolating the data as Fib had laid it out. My understanding is that it relates to a move from the July highs, where A, B, C are complete and we are moving up into D. Best. No complaints vis' your comments! I'm just wrestling with accomodating the wave pattern in the "C" wave from July's top with the "usuaual suspects" target areas in a "D" wave. My exploration has to do with what targets (and how the waves will complete) one might expect from what appears to me will be a really nice 5 wave pattern in this "C" wave, requiring only a 5th wave to complete. So, would a 5th wave that completes this "C" wave negate the "D" wave? expectation since theree would be a lower low? Would it require a 5th wave failure to retain the triange pattern? My e-wave "knowledge" is likely even more minimal, just exploring here. Don't know if Fib still believes that this triangle will contain price patterns through to the final wave E, but the price projections for the D wave seem to have been satisfied both on a closing basis and intraday basis (1510.63 intraday on SPX on Friday). I would like to first apologize for the long delay in replying to this thread, but I hope to make up for it with this post. Looking at the spx daily, it seems so obvious that the fall from 1560 is a text-book 5 wave display, with the 3rd wave "subdividing" -- but I've not seen any mention anywhere, so what is the flaw in this observation that I'm missing? One of the best ways to analyze a price pattern when attempting to apply an Elliott labeling is to generate the chart in line form. The advantage to this is that it tends to clear up the "garbage" that a basic bar or candlestick charting method will hide from the analyst's view...sort of like peeling the skin off an orange to reveal the fruit. From this, what could look like a simple 5 wave structure might expose something quite different altogether. To also help in further determining whether this same structure might be one of an impulsive or a corrective structure, an application of a momentum tool will also help in firming up the best count consideration based on the guidelines of count labeling presented by Elliott himself. The first chart below shows the SPX time frame in which we've been discussing (through 11/28/07) and I've applied a 5 day RSI along with the Hist MACD where one tool measures the speed in which the current price pattern is moving in relation to itself (RSI) with the other measuring the momentum of this same price pattern compared with other points within the total time frame being analyzed. When looking at this chart we notice that the first move down in the July/August period provided our customary "flag" and divergent points on both the RSI and the Hist MACD. This affirms that this same move down was that of a corrective pattern, in this case, labeled as wave "A" previously shown in this current thread. From there, we note that both of these same analytical tools moved to higher highs than that of the starting point seen back in July. Because of these higher highs, this then suggested that the bottom seen in the August period was not only that of a completed price pattern structure, but by moving to these comparable higher highs, this also suggested that a probable higher price high would also be seen before termination. However, looking at the daily volume bars of this same advance from the August lows suggested that there wasn't quite enough conviction to carry the price pattern much above this same July starting point, and as it turned out, the 3 wave structure could only then be labeled as wave "B" from where a retest of the August price lows was going to be necessary to finish up this price pattern's inconsistencies that separates sequences of one of a trending nature, from that of a corrective one. Now here's where the question is addressed and the flaw exposed. There are, of course, many impulsive wave guidelines in Elliott Wave analysis. One of these guidelines is that there can't be any kind of "overlap" to the price pattern sequence being measured. Another guideline that's helpful is that "flags", or points of extremes, are generated in either wave "3" or wave "A", and these flags diverge with wave "5" and wave "C" respectively. If we focus in on the week of 11/12, we see that we had an daily bar that moved to the 1500 level which overlapped the intraday lows seen during the late October period. Because of this, the pattern could not be a simple 5 wave sequence, with wave 3 subdividing, but something that of a corrective pattern structure. To again help us further in confirming this idea, when we look at the 5 day RSI during this same time we see that the price pattern was only able to generate divergent internal price momentum compared with the initial mid October decline. So between this overlap, and RSI divergence, what appeared to be a "text book 5 wave display", fell short in doing so, and therefore, can only be a (complex) correction - UNLESS the pattern was part of a larger 3rd wave extension - and this was the count consideration shared within this same thread. As mentioned within this thread, there are certain Fibonacci target points in which are used to not only verify the validity of a "preferred count", but these same price targets provide probable "trigger" points IF technical conditions compliment such a trade at these same target points. The next chart below includes the time period between 11/28 and this past Friday's close to be used as further reference. Using the count consideration posted in mid November, what was noticeable with the post Thanksgiving rally was that both the 5 day RSI and the Hist MACD showed quite a bit more (building) strength than one would usually see if this was a fourth wave correctional process when the price pattern blew through its initial 1.618 price target of the 1445 level. This insight then suggested that something was "different" that caused this same preferred count to be questioned as to its validity. Because the technical conditions did not compliment this same count consideration, this trigger point failed to materialize, and it was better to stand aside to wait for better conditions to present themselves (RSI divergence and/or a loss of MACD momentum). Based again on the guidelines of Elliott, this next possible trigger point became the 2.618 retracement level at the 1469 level. 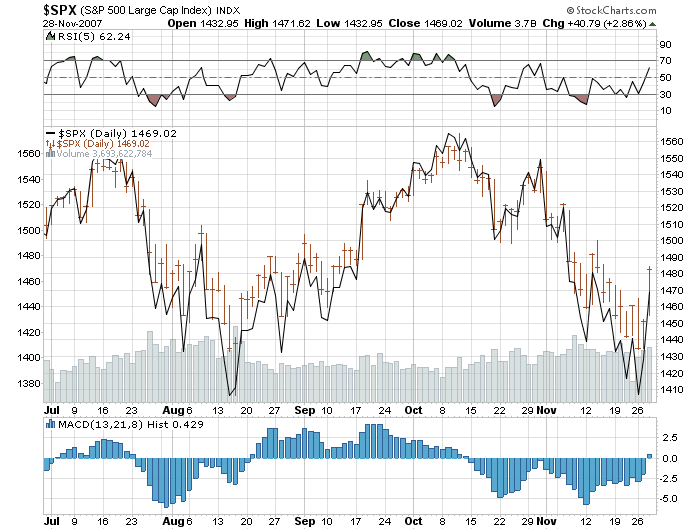 But here again, the RSI and the Hist MACD wasn't showing any loss of momentum. Because of this, and what had taken place during the November decline in this same regard, this same count proposal then became highly questionable, and something else indeed was going on that needed our attention. 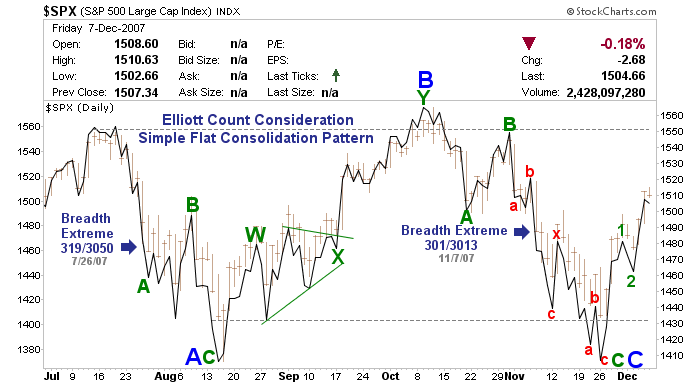 Moving forward, presented below are the updated preferred counts for both the Elliott flat and triangle count considerations updated through last Friday, and because of the volatility of the price pattern, I've also added a bar chart to both of the counts as to provide attentional clarity for each pattern. If we refer back to the RSI and Hist MACD tools shown above, both of these count proposals remain valid (especially if we add current breadth and sentiment data to the mix). However, Fibonacci target wise, we are now at November's .618 retracement level of 1508.47 where higher prices from here would pretty much destroy the triangle count shown (both on a simple trendline and Elliott Wave basis). It's getting late, but hopefully this reply answered both of the questions posed back in November, and with the updated charts, is helpful to others who are trying to follow along. THANKS ! for the extensive reply! where are we Elliott-ly speaking? We're currently in the 9 month cycle home stretch...due ideally to bottom on 12/19. The internals usually bottom about a month out from the actual price lows. This time around they appear to have bottomed on 11/21, and this is reflected in the cumulative data since that time. Count wise, let's go with wave E of the ongoing triangle with a price target of around 1460 cash. Thanks for your patience Mike - I'll try to be more timely when replying in the future. 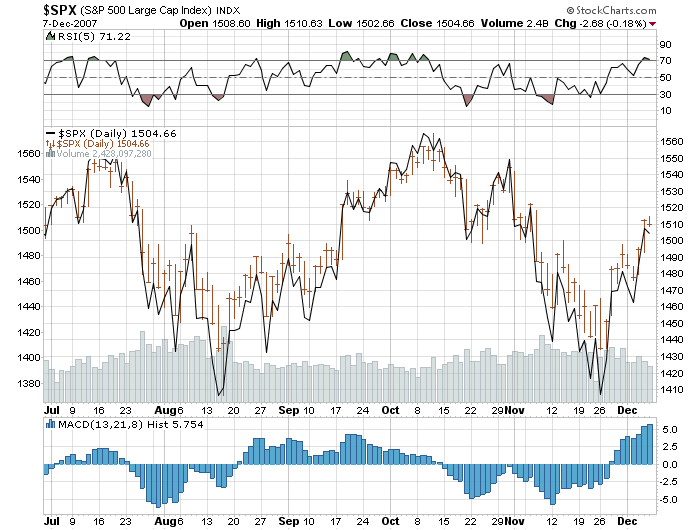 Thanks for your generosity in addressing my thoughts on the spx count! my thought wandering around airedale's 5 week hurst cycle being only 3 weeks along - mayhaps taking the 19 week further in time, so that the "E" wave target might well be lower than 1460..?? Below is the updated triangle count through Friday's close. Wave "D" encompassed 108.74 SPX points (1515.96 - 1407.22 = 108.74). Multiplying 108.74 x .618 = 67.20 points. Under the guideline of equality from the 12/13 top (1488.41 - 38.31) would give a price objective of 1450.10. Taking the difference between the two calculations would give us a target of 1449.43. One more Fibonacci target would be multiplying the 12/11 price range by .618. 1515.96 - 1477.65 = 38.31 x .618 = 23.68; 1488.41 - 23.68 = 1464.73. All price targets are based on close only numbers provided by Stockcharts, and shown on the updated chart. Thanks for your attention and generous explainations, and the charts! As an aside, I've wondred over the years about the use of closing values verses using the high low values. A thought is that closing values are just the place where transactions are occurring are when the bell rings. When it comes to Elliott Wave, I have found over the years that close only values provide better insight to this specific analysis for one is able to "clean up the garbage" of the intraday emotions that drive prices in one direction or the other. There is a beginning point, and an end, from where a "settlement" between buyers and sellers is agreed upon on any given day after all is said and done. Because of this, close only Elliott labeling becomes more transparent, and with the emotion that drove traders to this same end point, one can then attain a more deductive degree of trend that would compliment the rules and guidelines of the methodology itself. The recent "D" wave advance is a good example of this where two Fibonacci targets were hit pretty much on the button that helped in affirming the count. If one would had taken the intraday trades into consideration during this same price pattern sequence, these same price targets would had been widen to a point in which if you were trading with a large weighting towards this analysis, your entry and exit points would have possibly played into the emotional move of this same advance - where with close only, you would be able to make a trading decision for the next day without having to watch the screen all day. On the other hand, including high-low-close (intraday) bars to the mix can help during correctional sequences in applying the correct labeling. A case in point would be the November 14th intraday "overlap" seen on the chart in which was initially labeled as wave iv. Since fourth waves can not overlap second waves, and then applying the close only data as a guide, the further development of this same declining structure from the late October highs had to be adjusted to fit within these same guidelines for it to be one of trading merit. So, I guess, like everything technical in nature, having as much information you can certainly doesn't hurt, but assimilating all of this same information, and then providing context and balance within the definitions of what's being measured, does separate the chaff from the large bushel of grain, and above all else, provides better clarity. Could be...Might be...but was the Elliott Triangle complete at 1445.90 on 12/17? We should pretty much know the answer in the next couple of days.